The GT 740, both DDR5 or DDR3, is powered by the same base clock (993 MHz) with 384 cuda cores. Technically, according to the image above, GT 740 DDR5, with 5.0 Gbps memory clock, should run faster then the DDR3 version. This affordable video card can run Watch Dogs games on ultra settings (720p), which is quite impressive since Watch Dogs is one of the worst optimized games for PC. So how about 900p? ?, surprisingly, GT 740 can handle GTA V on very high settings. Now let's see the GT 740's performance on 1080p resolutions. According to the video test above, this graphics card can run Battlefield 4 smoothly on medium settings (33 Avg fps). Obviously, this GT 740 should run better on lower settings. GT 740 vs Radeon R7 250, which is the best for you?? 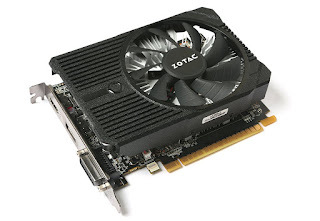 Among the graphics card under 100 dollars, the GeForce GT 740 fights against R7 250 directly. Technically, with 72 GB/sec memory bandwidth, the R7 250 is almost as strong as GT 740. 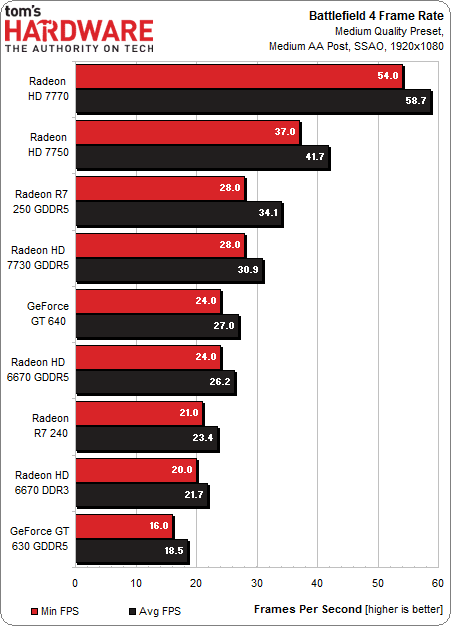 Too bad there is no GT 740 on test above, but at least we can see the strength of R7 250 compared to Nvidia and Radeon video card from the previous generation. Well from the benchmark above, R7 250 DDR5 can reach 34,1 AVG fps. Unfortunately, it fails to beat HD 7750 and HD 7770. GT 730's specification is less superior compared to its closest brother. Nvidia also released the 64bit version of this card, which is more ideal for a gamer who still uses 720p or 768p monitor. Unlike the DDR3, the GT 740 DDR5 version, with 64 Watt Max TDP, it requires one power connector. Fortunately, according to Nvidia geforce official site, 400W power supply is sufficient for this cheap gaming card. This is my favorite graphics card to buy to be honest. Here are the reasons: it's cheap, draws less power than its main competitor (R7 260X), and the most important thing, GTX 750 ti is still good for 1080p gaming. GTX 750 Ti's GPU engine is clocked at 1020 MHz with 640 Cuda cores. Nvidia has also featured this GTX card with Boost Clock, which means, it can overclock automatically depending on certain factors like GPU's temperature, load or power consumption. GTX 750 Ti, beside R7 260X, is probably the cheapest video card than can handle 1080p games with decent quality, thanks to its larger bandwidth and faster memory clock. This card's max TDP is just 60 Watt. That said, this affordable video card can work well in a computer with 400W power supply. In fact, if you look the image above closely, Nvidia recommends 300W power supply for this GTX 750 Ti.